It’s an exciting time to be interested in art, interaction, and information. The way we experience all three is changing. The way all three interact and overlap is evolving. Access to data and tools continues to enter new realms. What data is—is changing; it’s a social media feed, it’s a physical sensor, it’s a house plant, a novel, it’s open access to oceans of digitized archives and more and more APIs. What can we do with all this data? What can’t we do? Artists, designers and coders build and bend technology and give us a glimpse into what’s possible, into what’s next. Ones and zeros float all around us just waiting to deliver the next new interaction. The Eyeo Festival brings together the most intriguing and exciting people in these arenas today. We start with a day of pre-festival workshops and the 2nd edition of the Eyeo Summit. That night we kick off Eyeo with keynotes and a mixer. Then it’s three days of inspirational talks, demos, and labs and plenty of opportunities to connect with people whose extraordinary creations are pushing the envelope. The line up is amazing. A cast of brilliant individuals creates one amazing collection of talent and insight. Add yourself to the mix, and it just gets better. Converge to Inspire – Indeed. 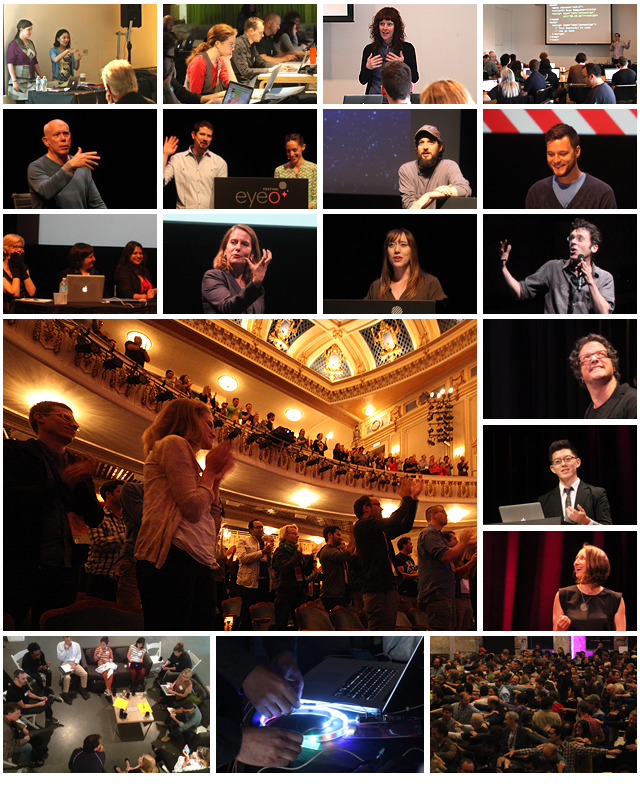 HISTORY ON RECORD – See what happened at Eyeo 2011/2012/2013 on Vimeo. IT’S BETTER WITH EVERYONE – The Eyeo Festival is dedicated to an inclusive, harassment-free experience for everyone regardless of gender, race, sexual orientation, disability, appearance, or religion. We like it that way. Our complete policy can be found here. Burak is a New York and Istanbul based artist working with complex networks. He takes the obvious social, economical, and political issues as input and runs through an abstract machinery, which generates network maps and algorithmic interfaces, results in performances, and procreates predictions to render inherent power relationships visible, thus discussable. Under the label Cod.Act, André and Michel Décosterd develop artistic productions, performances and interactive installations. Their devices do not deliver unique and pre-defined content, but combine and organize information according to variable parameters. Random, ephemeral, multidimensional, their work reveals itself each time different, infinite. Kate researches how people engage with networked technologies, and analyzes the political, cultural, legal, philosophical and policy-making implications. She is interested in how networked data becomes part of our understanding of knowledge, privacy, democracy, intimacy and subjectivity.